What are the top trends facing the world in 2014? And what should we do about them? Tensions in the Middle East. Rising living standards. Adaptation to climate change. Paralysed government. Innovative cities. The world is changing faster than ever. We’re connected to each other in ways that would have been thought impossible just a generation ago, enabling enormous potential but also exposing our institutions to great strain. If we are to effectively address the challenges we face as a planet, decision-makers need to keep pace and anticipate what lies ahead. To foresee the changes awaiting us in 2014, we asked the vast network of Global Agenda Council Members to identify and prioritise the issues that will exert the greatest force on the world in the coming 12 to 18 months. Using a selective survey tool, we began by determining the top 10 global trends. Knowing which trends to watch was the first step, but where do we begin to prepare for their impact? Harnessing the interconnected structure of the Network of Global Agenda Councils, we turned back to the Councils and asked them to tell us what should be done to address the multifaceted impact the trends will have on our world. 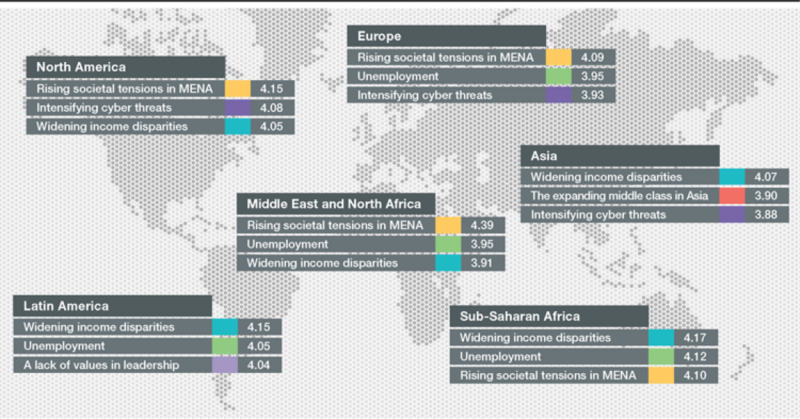 Click on the trends below for an overview of the forces that will shape 2014 and the ideas that can address their impact. How significant will the global trends become in the next 18 months? To follow the latest developments on these issues, take a look at the WEFGAC blog.